Please do come to our book release - Patient Safety - Protect yourself from Medical Errors on July 19 at KEM Hospital at 2 pm. 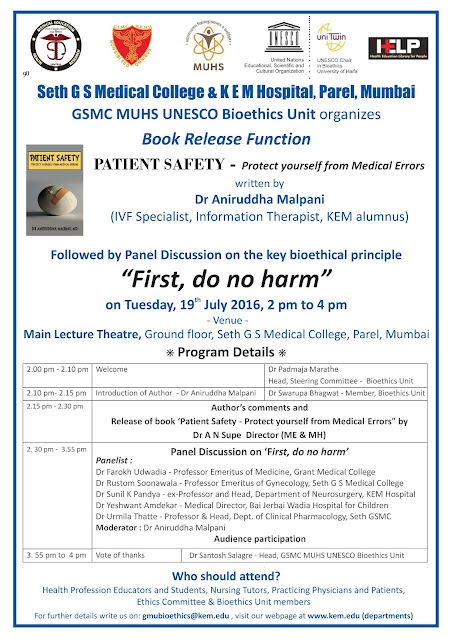 This will be followed by a panel discussion by Dr Farokh Udwadia, Dr Rustom Soonawala, Dr Sunil Pandya , Dr Yeshwant Amdekar and Dr Urmila Thatte on - First, Do No Harm ! We are all eagerly waiting for Manju's book.